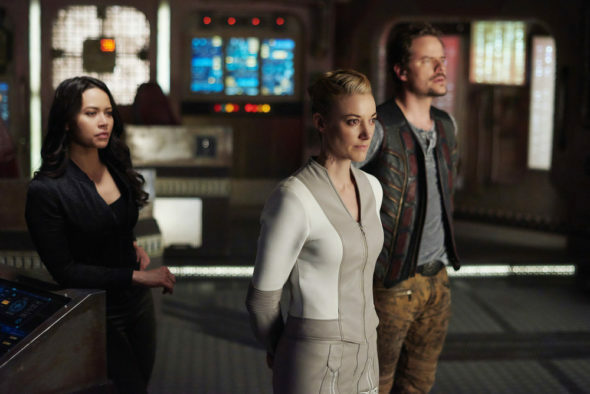 Dark Matter fans are anxiously awaiting the return of the sci-fi drama, and the series is one step closer to its release. Production has wrapped on season three of the series this week. Zoie Palmer, the actress behind the android on the series, went to her Twitter to reveal that production on season three of the SyFy drama had wrapped. Check out her tweet below. In other news today is day 93 of 93 on season 3 of @dark_matterTV! Today we wrap season 3, can’t quite believe it!! Season three of Dark Matter will premiere on June 9. Are you a fan of this series? Tell us what you think. A great underrated show. Deserves more exposure. Thooughly enjoyable to watch. Go numbers!!!!!! Dark Matter is a wonderfully intriguing drama that has captivated my attention from the very first episode. I am a huge fan and I adore number 5 !! This odd group of characters and their unusual circumstances have kept me intrigued. I look forward to this shows return. Anticipating this return. The odd lot of characters & their strange circumstances has made for enjoyable viewing. I look forward to seeing what comes next.